The FreeWheel lifts the front castors off the ground, turning your wheelchair into a sturdy three-wheeler that can take you almost anywhere you want to go. Grass, kerbs, and rough roads can be easily navigated, resulting in vastly increased mobility and independence. 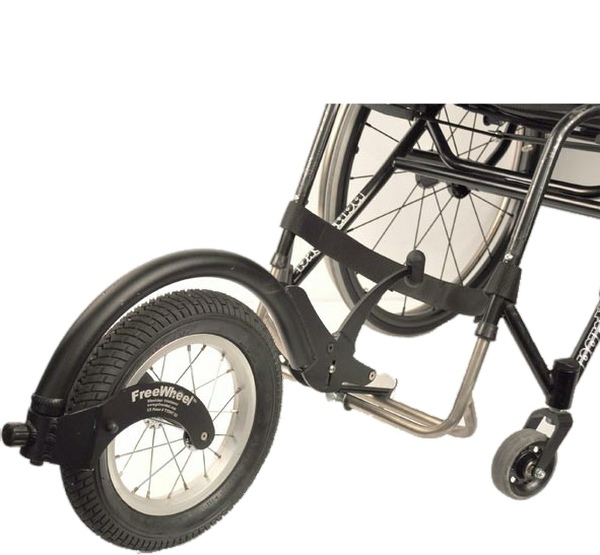 The patented FreeWheel is designed to fit securely on most manual, rigid frame wheelchair footrests, giving a secure fit and excellent handling (footrests higher than 4.5″ off the floor will require a custom frame). The large front wheel has less resistance than small castors and makes it easier to roll on any surface, whether you are alone, or with a companion.